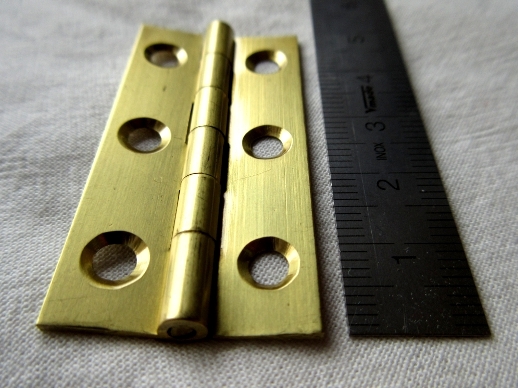 You are currently browsing the tag archive for the ‘Carpentry finals’ tag. The day began with us delivering our projects. There were two other students being tested, and they were busy unveiling very complex and very beautiful pieces of furniture that would have fitted quite well into an art gallery: a desk with glossy white surface atop an oak cupboard stood next to a tool box which opened in intricate ways to become a portable modelmaking studio. I couldn’t help feeling I was out of my depth. 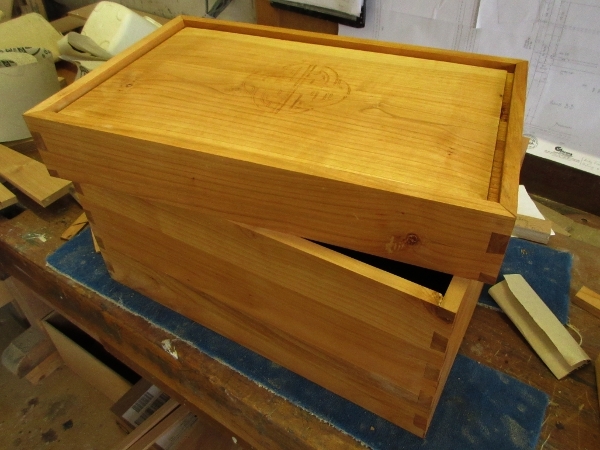 Fortunately hand tool woodworking has something of a mystique even among carpenters, so the others were too busy looking at the carving on the lid of my box to notice the dodgy bits of the dovetails or the wonky hinges. The exam was to make a child’s chair with a mix of traditional and modern joins. In seven hours. The three of us know each other and get on well, so we were more relaxed than you might expect. We also helped each other rather more than we were strictly supposed to, which I think irritated the examiners a bit, but it meant we all finished on time. As if this wasn’t enough, we also managed to discuss religion, ecology, global warming and the Tar Sands in the middle of all this. Afterwards, we hung around for two and a half hours while the examiners poked at the exam pieces, and then at six thirty our tutor came out and told us unofficially that everyone had passed. We were not supposed to be told this, so I had to keep you in suspense for the weekend. Today I wandered over to my former employer’s workshop, tidied the tools away for the last time, swept the bench clean(ish), chucked some leftover pieces of wood into the bin, said my goodbyes, and left. 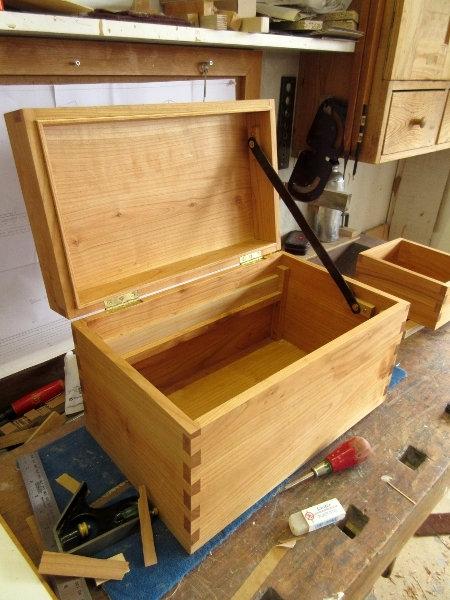 Thursday evening: the box outside the workshop and ready for delivery to college for the judging. I didn’t take it all the way on the Bakfiets. 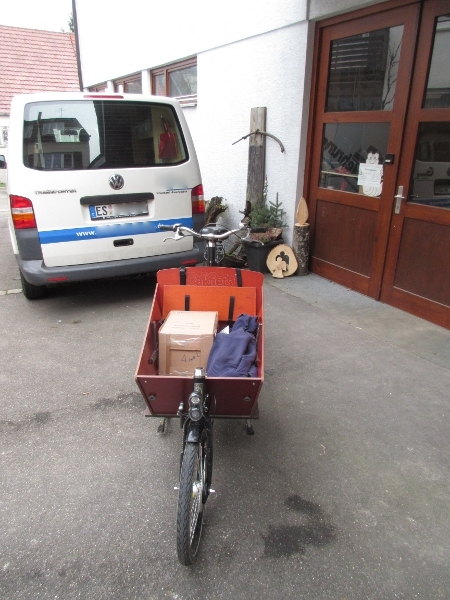 I designed the project to be small enough for easy transport on the Xtracycle, but this plan was scuppered by having to take lots of tools and wood for the exam on the same day. Yesterday the three of us being examined delivered our projects and built a chair in seven hours. The official letter to say if we passed or not arrives on Monday. The tray fits, and even moves up and down, much to the suprise of some people in the company who were trying to covince me it would go horribly wrong. The box is oiled, waxed, polished and (since the picture) packed ready to go to college. All I have to do now is get to college before seven in the morning today, hand the box in, build a piece of furniture in seven hours to a drawing I’ve never seen before, succesfully demonstrate how to use one of the machines, and survive an oral exam. 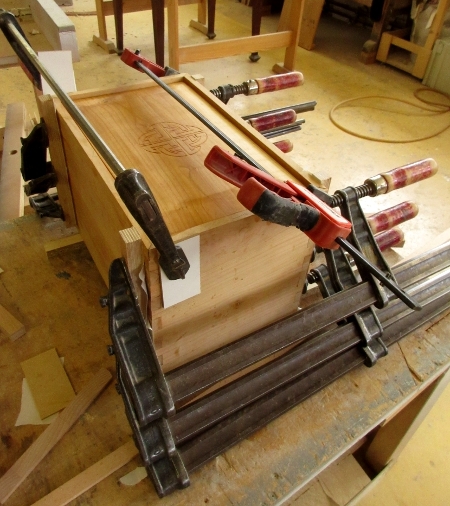 The sliding tray last seen heavily clamped a couple of days ago. Despite the ironmongery, the tray still managed to move out of shape again, and unfortunately it has to be exactly square or it won’t slide smoothly when the examiners play with it on Friday. The only thing for it was to pull two sides off and reset them. 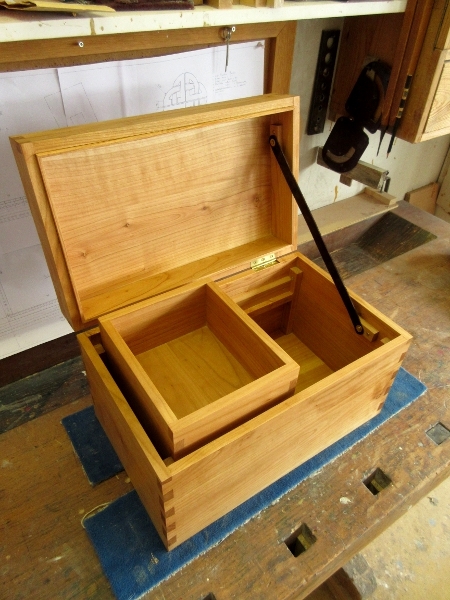 Fitting hinges to a box seems to require a lot of time and a broad vocabulary. This is probably why they aren’t used in normal carpentry very much. Another discovery today, was that soft leather stretches under pressure, so my carefully made strap needed shortening as it turned out to be entirely ineffective for holding the lid up. 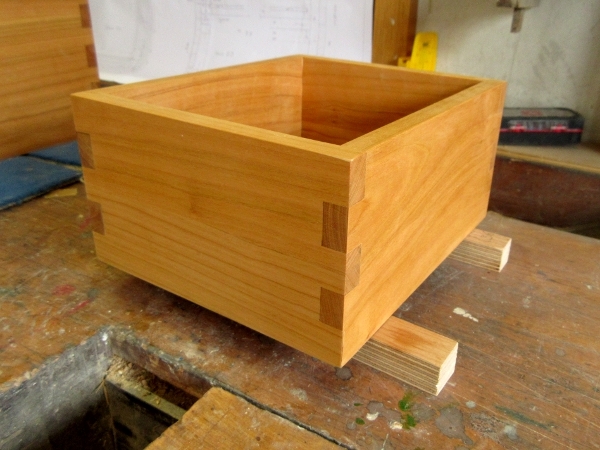 Finally managed the job that has been on my mind for ages: cutting the join at the top of the box to seperate the lid and the main body of the box. 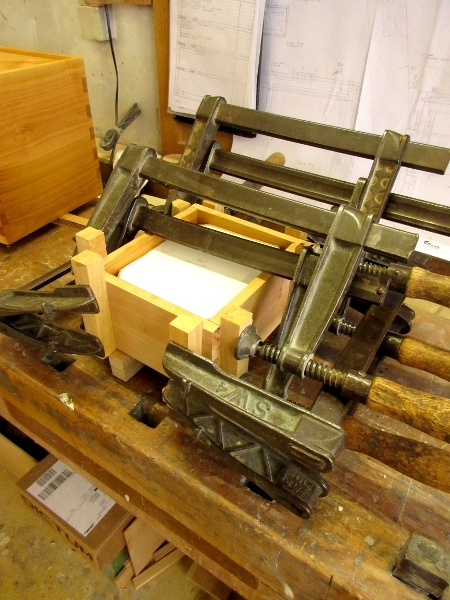 Somwehere in the middle of those clamps is the sliding tray that will go inside the box. This is the second attempt, the first one I made went out of shape and wouldn’t have worked as a sliding unit. As you can see, this time I’m taking no chances. Just to show I do get outside occasionally. 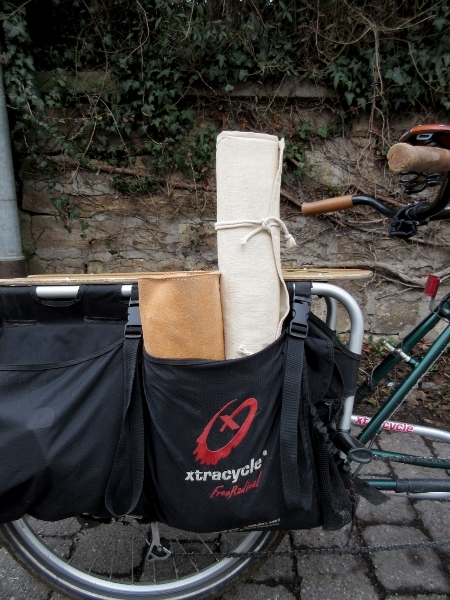 The Xtracycle carrying the chisel and saw rolls from my workbench to my employers workshop. It could be argued this is the ultimate in security: a box that doesn’t open. The first coat of oil revealed several weaknesses, in particular the angled cuts on several of the corners aren’t perfect. 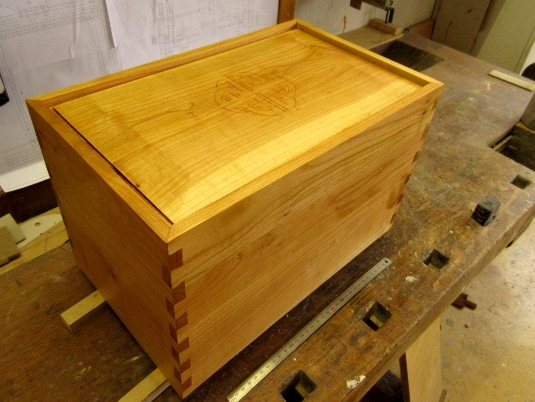 The results are decided on things like this rather than the addition of pretty carvings to the lid, but as long as I make the interior work I should be able to get a 3 or a 4.